The comparison is via flight time, not distance, so wind doesn't play. The SQ flight is still longer, despite the A359 being a touch faster. Wind absolutely makes a difference. It might be the most significant difference that doesn't allow these two flights to be properly compared. I will give myself a stern talking to for not taking into account the effect of relativity and time dilation between two aircraft travelling east vs west. Didn't you know the earth rotates at 15 degrees per hour, which is 900 nm per hour. There is an 8 hour time change between LHR and PER, that means the 787 didn't really need to fly all that far as in the 17 hours the earth rotated towards them ? Could you please expand on your position ? I'll explain it in a scenario. Let's say you have a long-haul flight that happens to have very favorable weather conditions on the day of departure (which the inaugural SQ22 did). Under an average air speed, you'll arrive early, significantly earlier than necessary (SQ22 landed a half-hour early). What do you do? Power through it? Or do you use the wind and milk it, maximizing efficiency? Ever noticed they compared two flights by flight time, not the similarity of the ranges? Or the fuel flow is by hour, not the mile? LOL. What a perfect way to make oneself fool. To all the believers - I know you know it's 10% or more. It's just those stupid people who don't know how to read FCOM, or maybe even forget those 8T in case of one or the others. If you do, please, let the aviators do their job, and don't spoil anyone else with your beliefs. If you fly coffin corner you don't have all that much leeway, do you? Also, I'd be curious to see the 343 in the chart, was there ever a v2 with that in it? The fuel burn per hour takes into account flight duration. The comparison is valid. The lighter aircraft with less fuel burn per hour will land with less fuel. The comparison is still valid. Less furniture weight but much more passenger weight. The 787-9 flights carried slightly more payload once you deduct fuel and empty weight. The payload plus remaining fuel upon landing are nearly identical between two flights. The two flights are absolutely perfect examples to compare ultra long haul fuel burn of both types. They provide the real data points at the far right of a range vs fuel burn graph. The advantage to the 787 only increases for the 787 as range becomes shorter. Once you start taking off well below maximum takeoff weight on a short sector the cruising altitudes are the same. The empty weight starts to play a big part on the climb fuel burn which is a bigger percentage of the flight duration as the flight length becomes shorter. If you check my original post. I have highlighted the important part. The 787-9 when flying the same payload the same distance burns nearly 10% less fuel on the trip. That is the 787-9's advantage. So my original post is still correct. It nearly hits a 10% advantage on short sectors. If I was forced to put an exact number on it using my small data set of real flight data I wouod say the fuel burn advantage goes to about 8.5% on a short sector. On the the majority of airports once you add fees the lighter frame makes the trip cost advantage exceed 10% on trips below about 2000nm. This excludes aircraft purchase prices and staff cost. I wouod say the fuel burn advantage goes to about 8.5% on a short sector. “I would say” versus an actual peer-reviewed technical analysis from FCOM data, I wonder which is credible! Peer reviewed? Are you joking? The graph even showed the A330 flying WAY further than it could. It was clearly rushed. The large 787-8 and 787-9 difference also makes no sense. I just did a search on your username. You have a large number of Airbus posts all positive. Just accept your favourite plane burns 4.5+% more fuel than the 787-9. I accept that the A350-900 can fly much further. In the "UA cancelled LAX-SIN" thread I was very positive towards Airbus. Unlike you I am not a fanboy. Here is my quote from the UA thread recognising the A350-900 dominance on this route. This is nothing more than UA realising the 787 can not fly LAX-SIN. It was a good test for the aircraft but it was optimistic to assume it could make a profit. People need to realise that payload range curves drop off a cliff at a certin point. As Jayunited pointed out the blocked seats in winter is significant. That extra 300nm makes a very big difference. Both SFO and LAX routes the aircraft will take off fully fueled, the only way to allow the aircraft to fly further is to significantly reduce payload. The normal 278T A350-900 would do the LAX-SIN route easily with full passenger loads in the middle of winter. It wouldnt even need the ULR model. The A350-900 payload range cliff starts to drop off about 300-400nm after the 787-9. Singapore will start SIN-LAX later this year with the A350. I expect UA will also start flying the route again when they get their A350's. I would expect UA to use the A350's on all routes over 7000nm. The A350 allows for nearly 50% more payload when compared to the 787-9 with a penalty of less than 10% extra fuel burn on routes above 7000nm. We've already had three people here confirm a 250kg^hr or 4.5% fuel burn difference. So lets call that peer reviewed. What you do not realise is I sent my spreadsheets to the thepinkmachine and oldaeroguy by PM. I didn’t publish that data in this thread, just the graphs from the resulting information. The manufacturers data includes data points beyond MTOW which is why the A330 data is like that. I since added dynamic MTOW so that those points are not displayed. The A330 displayed on the graph is the A330-200 which has some legs on it. I have since added the A330-300. I have updated the graphs to include the A330-200/300, A340-300, 777-200ER/LR, and 777-300ER from 1000 nm to 7000 nm. You have yet to show any data to support your claims, nor have you apologised for your previous insults directed at me. You might be right but can you explain me 2 things? Why don‘t they fly heavy loaded ULHs near MTOW on max altitude right from the start if coffin corner is far away? Why is SQ21 flying sometimes almost 1700km longer than GC and goes eastbound if winds are overestimated? For discussion. Tonight’s QF9 has a flight time of 16:54 with a flight fuel burn of exactly 91.0. Take off weight is 249.3/ 254.0, and it arrives with 4.5T of fuel. Carrying 210 POB so 26 empty seats all of which are in economy. Incidentally that arrival fuel gives the QF9 and Endurance over the destination of 1:10 with a landing weight of 158.1T. I’m not a mathamatician so make of those figures what you will. Last edited by Whatsaptudo on Wed Nov 07, 2018 12:26 pm, edited 1 time in total. Will it be possible to add the A350-1000 to the graph with what is known about its performance so far..? Since CX is the user of A350-1000, and probably that gives Zeke an access - I'd say most likely. But it's Zeke's to confirm. I certainly would look very much into that, especially with range/payload at the same levels. How much does it cost to have "extra seats in plane", when they're not used to the same extent? 359 vs 35J would answer that quite well. Thanks for input. It’s great to have insight into QF9 data. Your figures are pretty consistent with FCOM calculations. - What is the ESAD (equivalent still air distance) for tonight’s QF9. In QF we don’t carry alternates if the weather doesn’t require it, but as you can see, contrary to popular belief, we never arrive anywhere with min fuel. Last edited by Whatsaptudo on Wed Nov 07, 2018 8:49 pm, edited 3 times in total. By comparison the QF10 is 15:56 for 84.8. 4.7 over destination. Distance 7957 with an average overall component of 16kts tailwind. Both carrying about the same Pax load but the QF10 has about 3t more in the holds. 2. I worded that poorly. Wind does play a role, hence the routing changes, but the answer to the question "Should I fly faster or slower in a head/tailwind to save fuel?" is usually "It doesn't make much of a difference." Drag goes up pretty steeply after the optimum cruising mach for a lot of these transonic designs, so pushing up the speed to spend less time in a headwind usually doesn't yield much result. Now, in an aircraft not limited by sonic effects, that may be a different story. Regarding flying slower in a tailwind to save fuel, it sometimes brings a slight benefit, but not as much as many people think. The link I posted provides examples to back that up. As I explained up in the thread the A350 data is all digital, there is no performance books for it, to get the data out I have to use the onboard performance software. The version I have is the old database we had before the first aircraft arrived when I did my course, the -1000 database came later. For me to do the -1000 data I would need to update the database which I am in no hurry to do. I could do it at work, however when at work they would want me to be doing work. People will not like it if I use the later database with the better performance numbers as I am already being accused of cheating !!! We operate under EUOPS as well, there is no requirement under EUOPS or the ICAO Flight Planning and Fuel Management (FPFM) Manual to carry 3%, we use probability based contingency fuel. I mentioned further up in the thread how they carry a diversion point all engines prior to the destination. I assume that is 70 minutes at 1500 ft ? is that a holding rate or straight and level rate (hold rate is normally around 3% higher on everything I have flown for the turns) ? Does the plan also include the average ISA deviation as it has the average wind ? It may have, but it’s gone now. It looks like it burns less than 5.4/h in either direction at almost MTOW. More than 400kg/h less than stated earlier. Yes but around 15 tonnes less payload? Have you released that updated chart here? Terrific. Thank god we got that settled. Do we need a percentage of fuel burn delta vs a percentage of payload delta? Maybe that would satisfy somebody. I’ve given you the actual numbers to dispel the incorrect info given earlier in this thread. Make of the data what you will, but personally I could care less. Sorry, I didn't realize that you mean zeke's post about QF9/10, I thought that you mean comparison made with 40 tonnes payload. So.. you honestly think flying 17 hours westward and 17 hours westward at 5t/hr yield different total fuel burn? The only difference wind makes in both scenarios is how much ground you cover in those 17 hours. Shorter can refer to time and distance, in this case it is time. The 8% or so lighter aircraft arrives with half the fuel remaining? The difference is because of different flight planning at both airlines, not because the 789 burns 1 or 2% less fuel. That was my point. Glad you confirm that the A350 took the same payload over a longer flight with neglectable, 2 to 2.5%, more fuel burn, despite load being light, favouring the smaller bird, and the A359 being the heavier frame. Do we have any more samples from the Singapore flights? Thanks for detailed info. I just wanted to crosscheck your data with FCOM. Unsurprisingly, they match pretty closely… Out of curiosity, what Cost Index do you guys use for this flight? If you have it calculated in the OFP, we'd appreciate that info too. How does the statistical method work? Does it cover for 95% worst case scenario, 99%? Is it calculated on by route basis, or for the whole fleet? Why don‘t they fly heavy loaded ULHs near MTOW on max altitude right from the start if coffin corner is far away? It makes no sense to fly at max altitude, since the optimum altitude (yielding the highest mileage per unit of fuel used) is normally 3-4000 ft below the 'buffet limiting' altitude, or 'coffin corner'. Furthermore, max altitude may be limited by aerodynamics, or by available thrust - so that your jet will stop climbing before it ever gets to the 'coffin corner'. According to the FCOM data, the 789 max altitude is generally 'buffet limited', whereas the 788 is 'thrust limited', but not by far - so they will both fly close to the 'coffin corner' if you, for some reason, climb above the optimum altitude. OTOH, the A333 I flew before was 'thrust limited' by a wide margin of ~2-3000 feet. You just ran out of available thrust waay below the 'corner'. I was only going by what was posted on Oz Aviation. From the numbers you have presented the landing weight for QF9 was 158.5 which included the 4.7 tonnes of additional fuel on arrival, the FCOM data we have shows the burn at that landing weight and 8200 nm should be 89.77 tonnes (our numbers were based upon LRC). Up in the thread we were working on a 40 tonne payload, and landing with 8 tonnes in the tanks, which gave a landing weight of 176.85 tonnes. FCOM data says it just does not have the performance to fly PER-LHR with that payload. Working backwards from your ZFW (153.8) minus the payload (210 pax approx 21 tonnes) gives a DOW of 132.8 tonnes, I was working on an OEW of 128.85 for the 787-9, that would allow about 4 tonnes for catering. Did SQ actually burn 101 tonnes ? Read the posts by Whatsaptudo carefully and not just the headlines. The fuel required at dispatch in the case of the QF flights is "built up" to have at least 70 minutes on arrival. The total fuel, required fuel, and trip fuel are 3 different numbers at the planning stage, and fuel burnt is only available after shutting down. Also your previous comment was stating that the 789 burns 10% less carrying the same payload, there is nothing to suggest that is the case, QF9 looks like it is lifting around 20 tonnes on the route. Up in the thread I mentioned the effect of ISA variations, over 8000 nm an ISA variation on of +14 degrees resulted in a 4.2 tonne increase in trip fuel. Had a look at todays GPWT to the NW of PER at FL300 it is ISA+2 (-42 deg), out of SIN to the NE it is ISA+16 (-29). QF9 is not maintaining a constant level, the tracks show it doing a continuous climb for the first 5-7 hours which I assume is to maintain optimum levels via some form of block clearance. The routes that SQ traverse are fixed due to the number of crossing routes. A lot of relevant details which you simply do not understand, or are simply dismissing them as it does not meet your agenda..
We keep a track of every flight by city pair, type, and flight number. Also the actual fuel burn vs flight plan, taxi out time, holding time, extra burn vs flight plan, track flown, contingency left on arrival, departure/arrival times for every flight number by type. That means if we have a city pair that is flown by more than one type, we will have that city pair broken down by time of departure (flight number) and the aircraft used to fly it. Well with PBC (probability based contingency) you need to take the good with the bad, generally I will arrive with around 15 minutes above minimum diversion fuel, however if the port has a history of delays that will be built up or short cuts that will be taken out of the contingency. ICAO requires flight plans to include the expected SID and STAR, however with PBC if you are always getting track shortening your total contingency might be as as low as 300 kg. The ICAO Flight Planning and Fuel Management (FPFM) Manual which can be downloaded from IFALPA ( www.ifalpa.org/store/doc9976.pdf ) has some good information in it, our system is just a mirror of that. Well with PBC (probability based contingency) you need to take the good with the bad, generally I will arrive with around 15 minutes above minimum diversion fuel, however if the port has a history of delays that will be built up or short cuts that will be taken out of the contingency. ICAO requires flight plans to include the expected SID and STAR, however with PBC if you are always getting track shortening your total contingency might be as as low as 300 kg. The ICAO Flight Planning and Fuel Management (FPFM) Manual which can be downloaded from IFALPA ( http://www.ifalpa.org/store/doc9976.pdf ) has some good information in it, our system is just a mirror of that. Are the cruise speed for both comparable ? The max altitude we can actually fly at any moment isn't a constant. "Coffin corner" moves down with higher weight and higher temperature. That's true concerning standard cruise (standard CI). However, LRC or MRC would be a little lower, and also could be a bit different for both planes. For example, 773 has a .84Ma cruise at default CI, and IIRC below .82 at CI=0 (this would be MRC, if I understand the Boeing concept correctly). In reading this thread I have to ask.. Is any of this relevant as to what airplane the Airline should or could buy? Because none of you would be in on the FIX as to What any airline would purchase. OR? Whether they even Paid List price for either model. And that's what makes the difference. The Negotiations where United got the original A320/A319 Order didn't come as a purchase. It came as a LEASE. Don’t know enough about the 787 to comment on that. With the A350 basically everything is 0.85, best climb speeds, turbulence penetration, LRC. Bring the aircraft back to CI=0 you save next to no fuel. I put that down to the adaptive wings. In reading this thread I have to ask.. Is any of this relevant as to what airplane the Airline should or could buy? Because none of you would be in on the FIX as to What any airline would purchase. OR? Whether they even Paid List price for either model. Most likely not, but it satisfied curiosity. The Negotiations where United got the original A320/A319 Order didn't come as a purchase. It came as a LEASE. Now this is giving me something to think about. We know from an Interview with the TAP CEO that, going from the A359 to the A339 dropped the lease rate, same cabin, same equipment, same airline with the same credit worthiness and negotiation skills, by a third. In other words, Airbus charges a ~50% premium on the A359 vs. the A339. From diverse "the A330neo is dead/in trouble" threads we know (well, many posters claim) that Boeing can and does match the A330neo prices with its 787. If true, that means that Airbus is also charging a ~50% Premium over the 787. Now you don´t get to charge 50% more for a 10% bigger plane with 10% more payload and 10% more range if that aircraft also burns 10% more fuel (well, or the 787 10% less, which is a small difference). But you probably can charge said premium if the Aircraft is 10% bigger, can haul 10% more payload and carry the same payload 10% further, but carries the same payload over the same distance with just a small fuel burn disadvantage on top of extra revenue potential and route opportunities due to extra capacity. Commercial reality, if 787 price claims hold water, would rather support what our resident 787 & A350 pilots have presented in this thread. In reading this thread I have to ask.. Is any of this relevant as to what airplane the Airline should or could buy? Because none of you would be in on the FIX as to What any airline would purchase. If you read carefully the title of thread, you will find that it says “787 vs A350 range”, rather than “Should airlines buy A350, or 787”. Neither I, nor Zeke are Airline management specialists, nor do I pretend to have any knowledge on lease rates and such. Our job isn’t to choose most suitable airplanes for any particular airline. Yeah the A350 does everything at a lower speed closer to the ground compared to the A330/A340 (even been overtaken by a 737 !!). On a CONF 2 takeoff, V2 is basically F speed. on approach where I need to maintain CONF1 in a go around you can clean up in the A350. That beautiful big wing effortlessly lifts that aircraft, don't need to beat the air into submission with speed or thrust. That you to Zeke and thepinkmachine for keeping this thread on track despite the efforts of some professional argumentors. I have learnt a lot from reading it. Some of it didn't go over my head. Sales figures are showing that the 789 and A359 are very competitive. If one of them had a clear economic advantage it would be dominating in sales, but in fact both are selling well. The 789 seems to be selling a bit better, which is to be expected as it is slightly lower capacity. When you look at the actual sales they mostly appear to be rational choices based on what the airline is seeking. The A350 offers slightly higher range and capacity, while the 789 offers slightly lower trip costs. If the A359 really offered more capacity at the same fuel burn it would be dominating the sales. But it isn’t. Clearly the airlines recognize that each one is optimal for certain missions, and are buying accordingly. This is not like the 767 vs. the A330, or the A320 vs. the 737Classic, where the newer plane offered clearly superior economics. - first, we got the fuel burn figures for one flight for each type, and those flights were for different routes, different payloads, and different flying time. - The difference in fuel burn was found to be 4.5% between the two. Then another sample was taken for another flight, and suddenly the difference became 9.5%, more than double! What happened? small sample size? Or apple to orange comparison? Or both? - SQ had 10t remaining fuel at landing, while QF9 had only 4.5t. A difference of 6.5t is the same as having 65 more passengers on board. -SQ22 was half an hour longer, and so it had to carry around 2-3 more tons of fuel for the extra distance. - The configuration of the A359ULR is heavier than the regular A359 by around 2-3 tons minimum. - We don't know the cargo that SQ22 had in that flight, and we don't know its ZFW either. 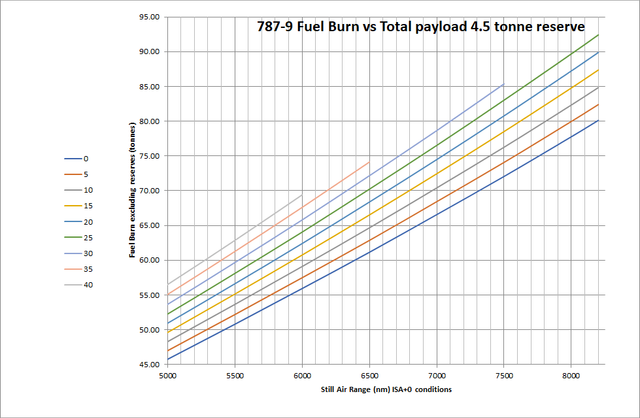 There are so many variables that would completely alter the result of the final fuel burn numbers, so this comparison is completely useless IMO. If you wanna do it this way, we should get more flights samples, and the flight distance, remaining fuel, and payload should be identical. On the other hand, we got the figures right from the FCOM, and they wwere confirmed by a 787 pilot and a A350 pilot. This gives you a more proper comparison for the fuel burn while carrying identical payload and flying the same distance. 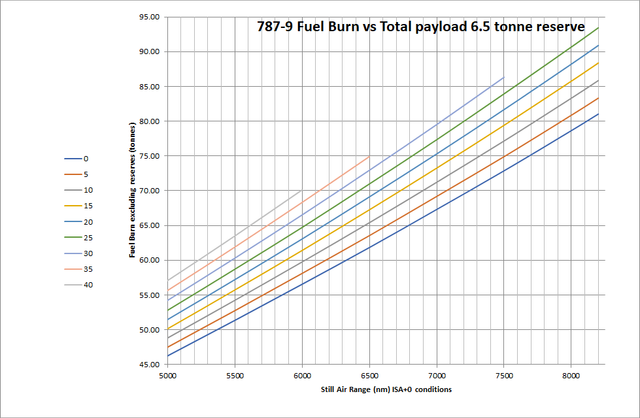 Remember, no one argues that 789 does burn less fuel than A359, but the your claim of 10% fuel advantage while carrying the same payload is way too much. Sure, 789 has a clear advantage in the parasitic drag, and the parasitic drag accounts for most of the drag forces at cruise speed, but the A359 has the advantage in the induced drag and the engine's TSFC in a way that it would close the gap a bit. I am curious though, how did you calculate the 10% difference? The 787-9 flights carried slightly more payload once you deduct fuel and empty weight. . I gave the SQ22 a reserve fuel of 4.5t to match that of QF9's flight. I counted the remaining fuel as payload as it was optionally carried. Now, if you would want to compare those figures for identical payloads, you will have to add 4.5t of payload to the QF9, but then that would exceed 789's MTOW, and it won't be able to do that in the first place. For the sake of argument, let's say 789 was able to take off with a higher weight. Then, you will want to add another 2.5t of fuel for the extra half hour the 789 would have to fly in order to match the time SQ22 spent flying. Now that 789 became heavier by 7t with a supposed TOW of 256t, you will also have to add more fuel to carry that extra 7t, which will bring the TOW of 789 to what? 260t? more? If hypothetically 789 was able to take off with 260t, then it wouldn't burn only 91t of fuel for the trip as it would if took off with 249t. See, you can't even compare those two flights to get a useful fuel burn figure. Let's stick to the FCOM, or get us some figures from flights with identical range and payload. As i said from the very start you can fudge the numbers by giving the A350 an unrealistic empty weight. The lighter you make the A350's empty weight the more payload it appears to take. You can ignore the typical OEW on wikipedia, yet use the correct OEW for the 787. So the A350 flew 2% further with 2% more payload. The 787-9 had 9.5% less fuel burn per hour. The easiest way to compare these is to deduct 30 minutes of fuel from the A350 to get equal flight length and deduct 0.5t of payload. So if you reduced the takeoff weight from 273t to 269t that is less than a 2% reduction in flying weight. That just reduced the 787-9's fuel burn advantage from 9.5% to 6.5%. How can anyone accept Zeke's graph that shows less than 1% difference? Every bit of flight data samples I can gather shows a 5+% fuel burn advantage to the 787-9. Also has the advantage of higher cruise altitudes with the thinner air which reduces drag and fuel flow. I am curious though, how did you calculate the 10% difference? Seems to be as scientific as pitting ones finger in the mouth, removing it, holding it up, and then professing the wind strength, direction, temperature, and pressure. The FCOM numbers indicated that the 787-9 with 21 tonnes of payload (including catering) when landing with 10.1 tonnes of reserve would burn 93.225 tonnes, when landing with 4.5 tonnes 90.379 tonnes. That equates to a cost of 508 kg/tonne to carry a tonne.Then you would need to take the 5.6+2.846=8.446 tonnes out of the 21 tonne payload as they are at MTOW limited. The 787-9 would be down to 12.554 tonnes of payload (about 125 passengers), and we haven't even taken account for catering. Now I know where Lion Air went wrong, they used Boeing data instead of wiki. No the A350 number on wiki is not the BEW/OEW which is more like 135 tonnes for a standard A350, that number would be an BEW/OEW+catering number which is called Dry Operating Weight. It seems to be very heavy, even for our longest flights we only take 4-5 tonnes of catering. 7 tonnes of catering is excessive. That number would not be representative of the SQ ULR aircraft. We also know the ULR is several tonnes lighter than the standard A350 with half of the water tanks, cargo system removed from the forward bay, it has the better engines, the new winglets, and other -1000 enhancements. I have posted before on this thread "Working backwards from your ZFW (153.8) minus the payload (210 pax approx 21 tonnes) gives a DOW of 132.8 tonnes, I was working on an OEW of 128.85 for the 787-9, that would allow about 4 tonnes for catering." We never use OEW in real life, we have the basic weight, add catering, and get D(ry)OW. The reason being the catering for a 787-9 domestic sector say BNE-MEL would have two pilots is going to be vastly different to an international flight like PER-LHR with 4 pilots and extra cabin crew. They cannot have 25 tonnes of payload, as it leaves no weight for catering and the heavy crew for the long haul flight etc. The 787-9 does not have the range to fly 25 tonnes of payload plus catering over 8000 nm, let alone 8200 nm. This the total payload in steps of 5 tonnes from 0 to 40 tonnes, over 5000-8000 nm. The 5 tonne payload capability would be an empy aircraft with just catering loaded. WHERE does it say SQ22 burnt 101 tonnes ? Where does it say they had 4.5 tonnes reserve ? As I mentioned to you before you cannot know the amount of fuel burnt until the flight has been completed. You are happy to accept the amount of fuel burnt for the 787, but you want to compare that to the planned required fuel before departure (the twitter picture were pre departure). They also said they had in excess of 10 tonnes above that number available at the destination, not 4.5. Another F in maths and comprehension there. The A350 had a payload of around 23 tonnes for that flight plus it landed with over 10 tonnes at the other end. so 23 tonnes plus the extra fuel they landed with that could be converted to payload (10.1-4.5)= 5.6 = 28.6 tonnes. 28.6/21.0 = the A350 carried 36% more payload. The A350 also had the capability to increase TOW another 7 tonnes, where the 787-9 was a half tonne below MTOW, which would be around another 5 tonnes in payload for the A350 (ballpark 2 tonnes to carry the extra 5 tonnes), which would mean 60% more payload over a longer flight time. Easy because the FCOM data was for the same payload, over the same distance, in ISA conditions. The A350 here is lifting at least 36% more than the 787-9, it is flying longer and it is ISA+14 which I have already described above adds over 4 tonnes of fuel.